It’s Here! It’s HERE!!! FBCookieSwap!!! 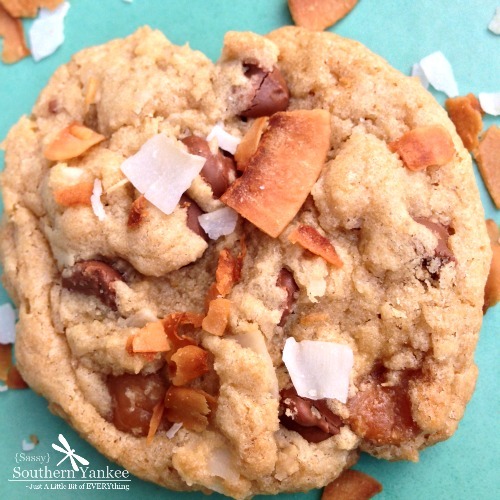 Hints of toasted coconut, rich chocolate and creamy caramel make this Aloha Cookie my new favorite cookie! This is my take on those delicious girl scout cookies we all know and love. Finally the Big Day has arrived! This is my second year participating in the cookie swap to end all cookie swaps! This year’s swap was extra special because not only do we get to share a ton delicious cookie recipes with you like these Aloha Cookies, but the food bloggers and sponsors (OXO, Imperial Sugar and Land O Lakes) involved also raised over $7,000 for one of my favorite causes, Cookies for Kids’ Cancer!! Huge thanks to all of the sponsors and bloggers who made that possible. That’s AMAZING! It’s a mind-blowing how many wonderful people I have met over the last month. Food really does bring everyone together. I can’t begin to tell you how wonderful it has been working with OXO, Imperial Sugar and Land O Lakes each of these amazing companies provided me something special to use for this delicious recipe! 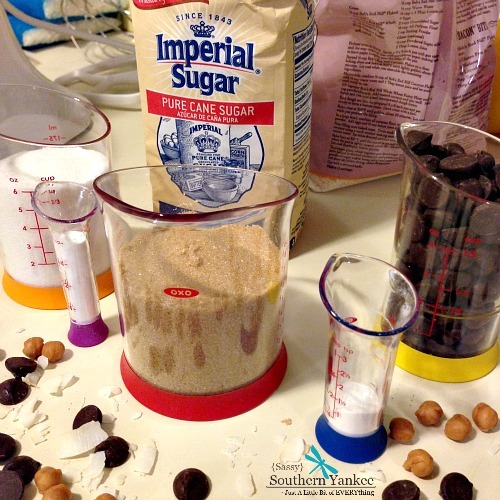 OXO provided a set of their beaker measuring cups so my mini mad scientist could whip up this delicious recipe. Imperial Sugar aided in the sweetness department and also gave me a silicon baking sheet to help prevent sticking and Land O Lakes gave me the butter baby! I love me some butter! Huge thank you to all! If you’re not familiar with the swap, each holiday season we bake up a batch of cookies and send a dozen out to three food bloggers from all over the US, and it’s done Secret Santa style. You never know who will be sending you cookies until they arrive at your door. The best part is that they have a group of Gluten Free Bloggers such as myself that participate, so I can actually eat the wonderful cookies! I know that in my house, it’s always really exciting when tasty packages arrive! This year, I received delicious Triple Gingersnap cookies with Lemon Cream filling from Lindsey at Cafe Johnsonia, Soft Batch Molasses Cookies from Shashi at Runnin Srilankan, and Gluten Free Almond Sugar Cookies from Chris and Tara at Simple Food 365. In a stand up mixer cream together the butter and sugars; once light and creamy add in the eggs one at a time until combined. Next add the vanilla extract, coconut extract, caramel extract, salt, baking powder, baking soda, corn starch and the GF flour blend; blend on low/medium speed until combined. P.s. aren’t these beaker measuring cups from OXO adorable?!?!?! They make baking fun and easy! I love playing mad chef in the kitchen 🙂 Last but certainly not least add the dark chocolate chips, caramel bites and Unsweetened Coconut. Place the dough in the refrigerator for about 30 minutes. I’ve found that by waiting and allowing the mixture to firm up a bit it produces fluffier cookies that are baked to chewy perfection! 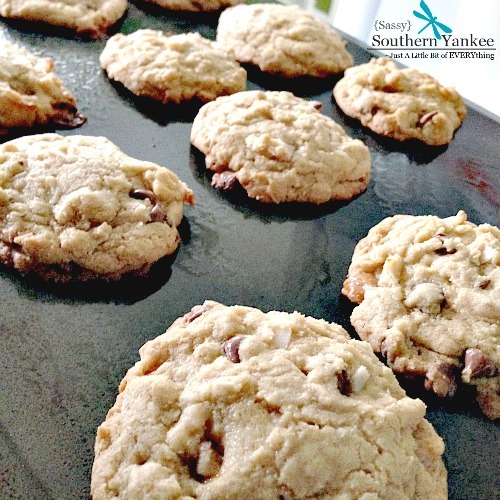 This recipe makes 3 dozen cookies with 2 extra for taste testers (Hey the chef needs a cookie too!). 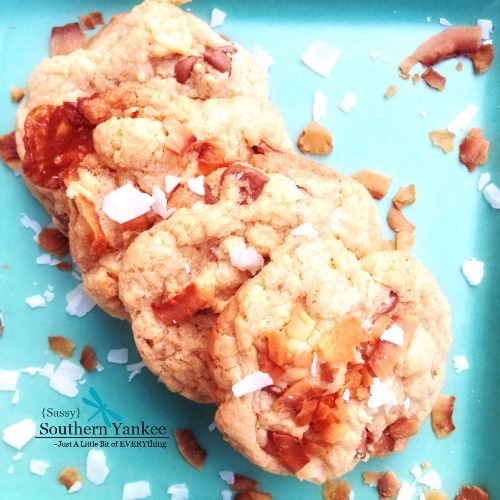 I hope you enjoy these Aloha Cookies as much as I do! Wishing you a wonderful Holiday season! Thank you to Lindsay from Love & Olive Oil and Julie from The Little Kitchen for hosting and putting together this amazing recipe round up! 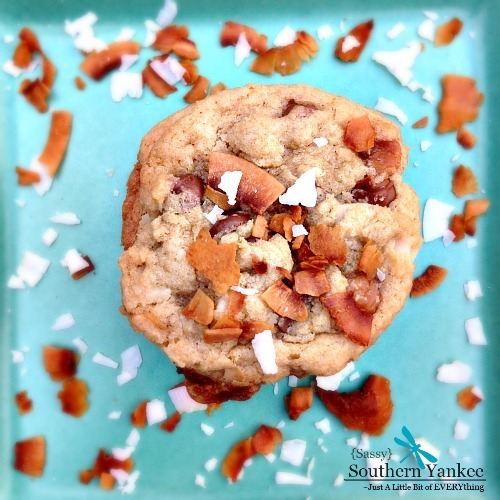 Hints of toasted coconut, rich chocolate and creamy caramel make this Aloha Cookie my new favorite cookie! This is my take on those delicious girl scout cookies we all know and love. Next add the vanilla extract, coconut extract, caramel extract, salt, baking powder, baking soda, corn starch and the GF flour blend; blend on low/medium speed until combined. Last but certainly not least add the dark chocolate chips, caramel bites and Unsweetened Coconut. Place the dough in the refrigerator for about 30 minutes. I've found that by waiting and allowing the mixture to firm up a bit it produces fluffier cookies that are baked to chewy perfection! This recipe makes 3 dozen cookies with 2 extra for taste testers (Hey the chef needs a cookie too!). I hope you enjoy these Aloha Cookies as much as I do! Wishing you a wonderful Holiday season! This entry was posted in Cookies and tagged Bobs Red Mill, butter, Caramel, Chocolate, Christmas Cookies, Coconut, Cookies, cookies4cancer, cookies4kids, Dixie, fbcookieswap, Girl Scout, Girl Scout Cookies, Gluten Free, Gluten Free Cookies, holiday, Imperial sugar, Land O Lakes, OXO, OXOg, OXOgoodcookie, Samoas, Tropical. It took every ounce of willpower to not eat the entire dozen! Thanks so much!